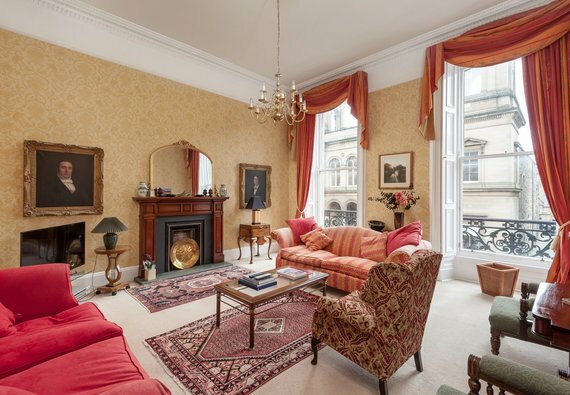 The Palmerston Place Residence offers guests elegant Georgian proportions in the heart of Edinburgh’s genteel West End. The vibe in the bright double windowed lounge is one of opulence and peace and quiet. The apartment sleeps 4 comfortably in 2 large separate bedrooms. Haymarket Station is within a 5 minute walk of the apartment. The centre of Edinburgh is also a mere 5 minute walk. There are many West End restaurants and pubs to provide food and refreshments on your doorstep. After a long day sightseeing and gallery hopping, gather and relax with your family and friends in the spacious, classically decorated living room. For those quiet, cosy nights in, this apartment is set up with TV and WiFi access, so you can get comfortable, sink in to the sofa and forget the hustle and bustle outside. Fancy taking a break from the vast array of taste temptations around the city? No problem, feel free to show off your culinary skills in this property’s large and well equipped kitchen. You will find all that you need to wine and dine your friends around the dining table. The master bedroom has an ensuite shower and a sumptuous double bed. The Second bedroom has twin beds. There is a main bathroom off the hall which boasts a large bath so you can enjoy a relaxing soak after a busy day sightseeing. The Palmerston Place Residence benefits from a fabulously central location within the heart of Edinburgh's West End, in a residential Georgian street that perfectly demonstrates the New Town grand design. The location enjoys all the perks of city centre living with a great selection of independent shops, cafes and restaurants, as well as familiar brands. The Dean Village and Stockbridge, two of Edinburgh's best loved areas, are a short stroll away and perfect for a lazy Sunday brunch or spot of people watching. Edinburgh's three largest art galleries, The Scottish National Gallery, The National Gallery of Modern Art, and The National Portrait Gallery are all one mile or less from the property. When it's time for something a little more touristic, all of Edinburgh's main attractions are in easy reach. Edinburgh Castle, The Palace of Holyroodhouse and The Old Town are within two miles, and frequent bus services depart from just around the corner with destinations such as Royal Yacht Britannia and Rosslyn Chapel. The Palmerston Place Residence is best suitable for families with older children, and couples. Entry to the apartment is from 16:00 onwards; however, please note that arrivals after 22:00 will incur a late fee of £50 for unsociable hours. Earlier entry can perhaps be arranged but depends if there is a departure at your chosen apartment that day. This can be confirmed within 48 hours of arrival. If you are arriving earlier than 16:00 on your day of arrival, it is always worth contacting the property manager as they will always endeavour to give you access as soon as possible. You may be able to arrive early and leave luggage and come back however this is not guaranteed. Sleeping arrangements One double bedroom and one twin room. Interior layout Traditional Edinburgh tenement with no lift. Please note this property many not be suitable for people with mobility issues. No reviews yet for The Palmerston Place Residence.